Are you crystal clear on how you want to feel this holiday season? Do you know exactly where you want to focus your energy and attention so you can experience love, expansion, and joy? If you answered “YES!” to these questions, chances are you don’t need my message today. You’re intentional! If you don’t have a clear intention this holiday season, this message is for you. I want you to feel empowered, alive, and HAPPY at every event you attend this holiday season, and I have a video that will show you how to do so. I set intentions for just about everything. Festivals. Vacations. Holidays. Reunions. Parties. You name it. I put focus, attention, and heart into every aspect of my life. Setting a simple and powerful intention helps me make better choices. The more specific and focused I am, the happier and more fulfilled I become. In fact, I’ve been very intentional for the past 5 months. I’ve been clear that I wasn’t ready to write an email to all of my wonderful subscribers because I haven’t felt grounded and connected to my truth. I’ve been sifting through my beliefs, concerns, and stance for the world because let’s face it, mama Earth has been crying out for help. With the natural disasters, the white supremacy, the mass shootings, the #metoo campaign, and the overall political climate of our world- I’ve been processing triggers all the while pouring my heart and soul into my private clients and retreats. I didn’t want to send you an email until I felt grounded and trigger-free. I’m happy to stay that I’m on the other side of this hibernation and no longer feel the need to safeguard my energy and thoughts. I’m ready to serve you with a quick video I shot this afternoon after an inspiring coaching call with one of my clients. Thank you so much for your patience with me. I’m thrilled to be back in your inbox. 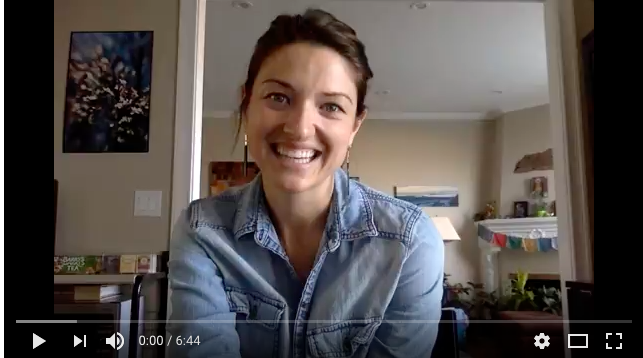 Here’s a video on how to create your own powerful intention this holiday season so you can get you want (and light up the room in the process). You are the source of your life, dear one. You get to decide and create the atmosphere, energy, and overall mood of every life circumstance you interact with. I’d love to hear the intention you’ve created for yourself this holiday season, and how you want to feel about yourself when these experiences are complete. Let me know in the comments, and I’ll personally write you back! I’ve missed you so much!